Well Planned Mom – Just because you planned it doesn't mean it will go as planned! Just because you planned it doesn't mean it will go as planned! Planner 101: #2- Why a paper planner? What do I need to get started? You won’t find anything digital here! For me, everything revolves around my planner. The good, the bad, and everything else is contained between the covers of my planner. Let me just say upfront, that there are many ways to plan. And having any kind of plan is better than no plan at all! Some people prefer to keep a wall calendar, some use outlook on their computer and others exclusively use their phone to keep track of this thing we call life. I however, insist on a portable paper planner. I’ve had many over the years. I mean lots! I’ve discovered that I like having a monthly and weekly layout. I like vertical columns. I like color. Your planner will end up being as unique as you, so just make sure to find one that has the layout you desire. Now I hear some of you saying, “but I just use my phone.” I want to tell you a few reasons you need a paper planner instead. You get an overall view of the whole week, and let’s face it, you just can’t get that on a tiny phone screen. You can do your meal planning for the week. You can plan your cleaning routine for the week. You can keep track of your fitness goals each day. You can plan when you will do your errands & shopping. You can plan appointments, therapies & meetings. You can see birthdays, anniversaries and weddings ahead of time. You are more likely to remember when events are if you write them down. You can journal about the day’s events after the day ends. In addition to all these reasons, you can keep your to do list, grocery list, house project list, bible study notes, homeschool lesson plans, sports schedules and so much more in a paper planner. I dare you to fit all of this in your phone! Now that I have convinced you to go out and buy a paper planner, I want to move on to the supplies you will need. 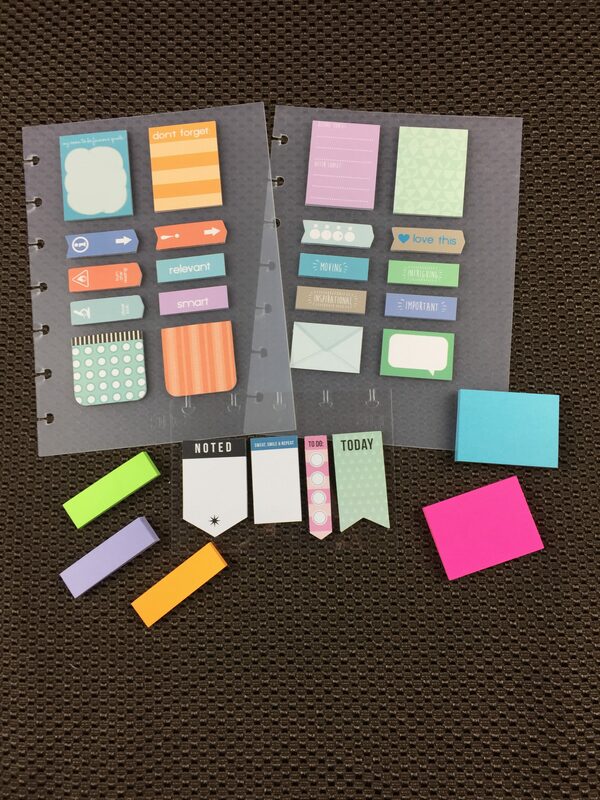 There are some basic supplies that are necessities for planner users, and some supplies that are just nice to have. Classic size Happy Planner, Mini size Happy Planner, portable punch and desk punch. Planner & Punch. Let’s start with what you NEED to have if you are going to start using a paper planner. First, you will need a paper planner, but continue reading through this paragraph so you understand your options. 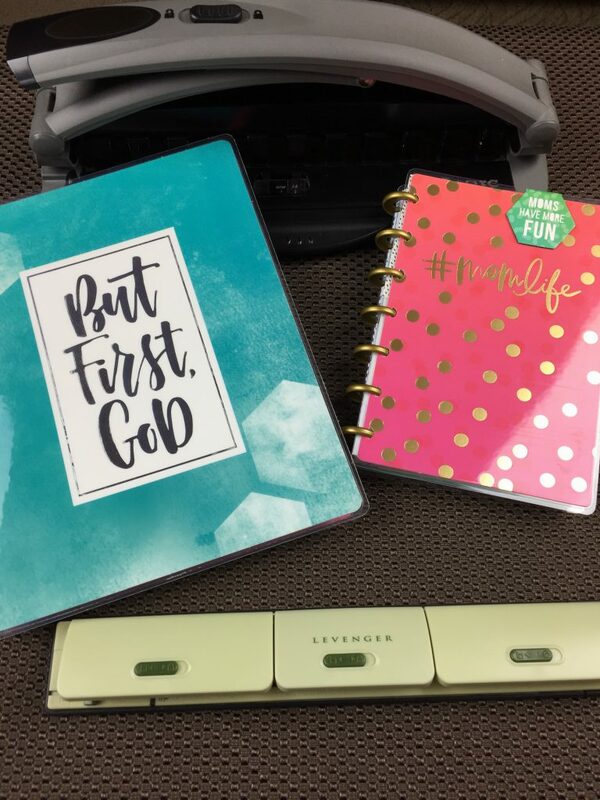 You will also need the paper punch that goes with your planner if you have a ring bound planner or a disc bound planner. Franklin Covey has a paper punch that goes with their ring bound planner and gives you the ability to add pages that are not already pre-punched. Likewise, if you have an ARC by Staples planner or Happy Planner by Me & My Big Ideas, you will need the special paper punch that allows you to punch pages and add them to those planners. 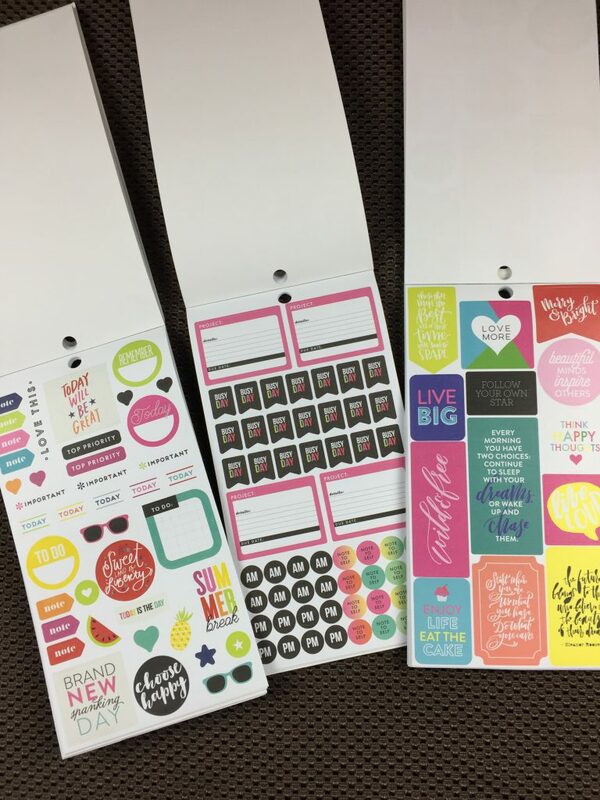 If you have a spiral bound planner such as Erin Condren, then you do not need a punch as you are unable to add additional pages to this kind of bound planner. You could even go really basic and print out some undated calendars and stick them in a regular 3 ring binder if you wanted. 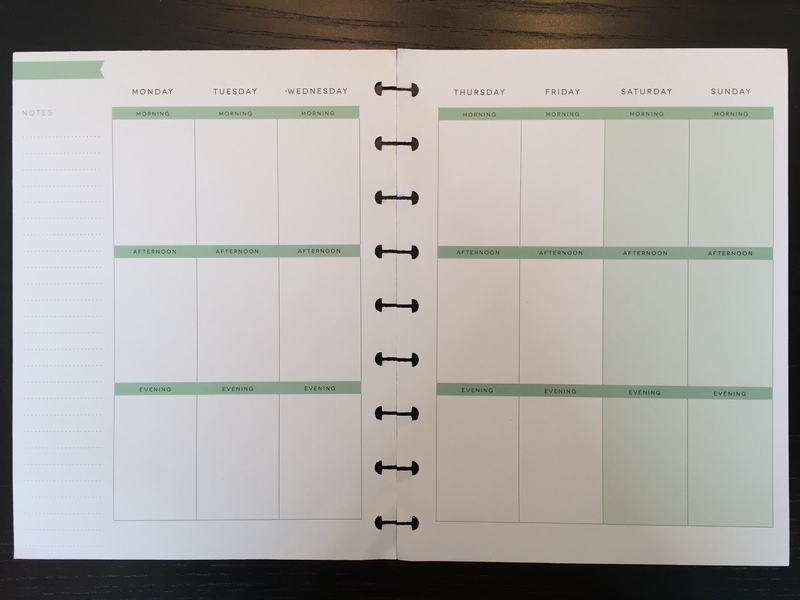 So if you don’t already own a planner, just keep in mind some have a fixed number of pages with no way to add pages in the future, and some are very versatile and will allow you to add pages and move sections around to your hearts content. My favorite planner is the Happy Planner. I love how much I can add to it by having the punch and the fact that I can use it interchangeably with my ARC notebooks. You may find that I refer to my Happy planner quite a lot, and although this is what I will be using, the methods and how I am teaching you to use your planner can be adapted to any planner out there. Pens. 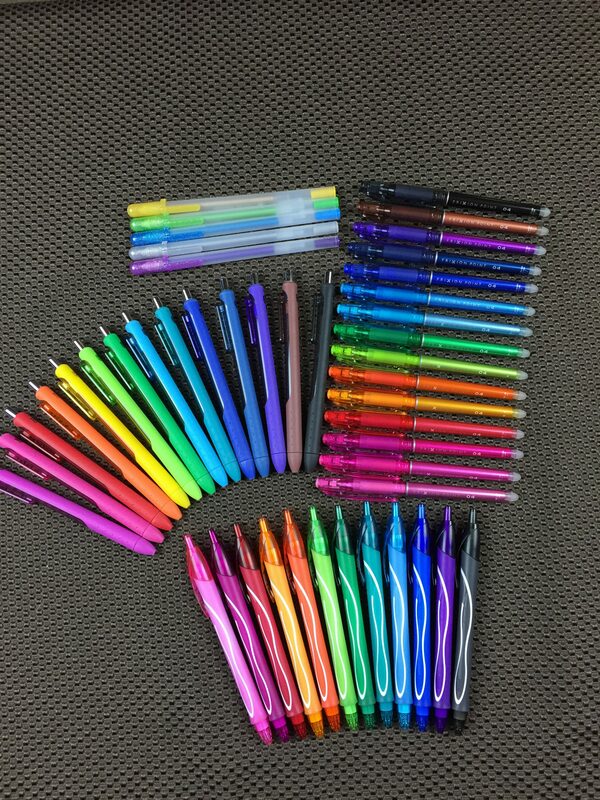 I love pens! I keep thinking that some day I will find that magic pen that makes my writing perfectly neat and professional looking. Don’t get me wrong, I have perfectly acceptable and legible handwriting. It’s way better than any doctors writing, but not quite as perfect as I think it could be. It has been improving over the last 7 years as I’ve been homeschooling our 3 children. It’s almost like I’m being re-taught myself. Anyway, there are many different pens to choose from. Some people prefer a good ole’ #2 pencil that they can erase if need be. I need color, so I was using the Paper Mate Ink Joy pens until I discovered Frixion pens by Pilot. These pens are amazing!!! They are bold color gel pens in a variety of colors, but best of all they are erasable. I’m not talking about the kind of erasable stick pens we had in the 80’s and 90’s that would leave a shadow of what was once there, along with a trail of little eraser shreds. I’m talking about a fully erasable pen. So if you have a lot of appointments that are in a constant state of being changed and canceled, these just might be the pens for you. Post-its in multiple sizes, shapes, colors and patterns. Post Its & Page Flags. These are just great to have in any kind of planner. We also use them later on when I explain how to set up a planner dashboard. So find some post its that go with your planner in various sizes or shapes. I like to find some that are roughly the same size as my daily columns or boxes. Now for the fun extras! None of this is necessary to be an efficient planner, but it is awful colorful and fun! Washi tape can be found in multiple widths and colors. Washi Tape. It comes in all different colors, prints and patterns. It is a thin, slightly sticky tape that comes in multiple widths and is good for marking weeklong events or boxing in special events on your pages. I have several different brands of washi tape and so far I have been able to remove it without tearing my page or leaving behind any sticky residue. 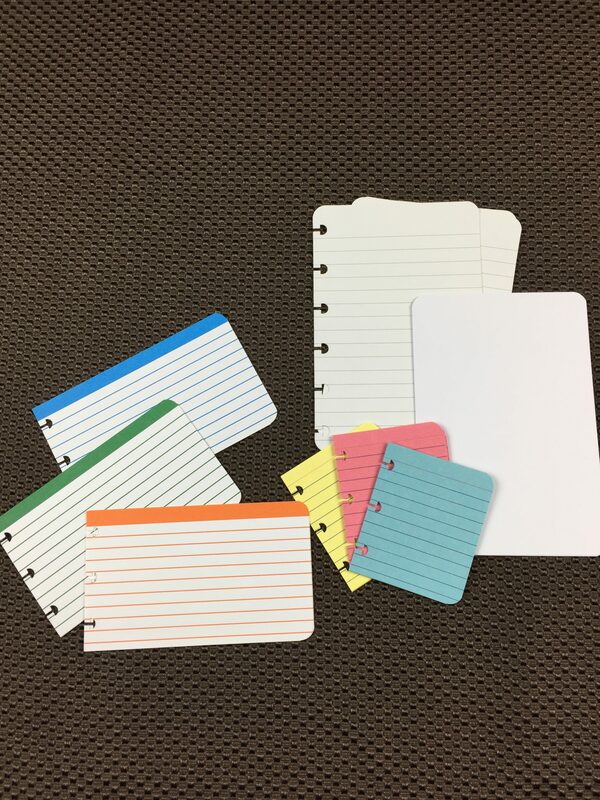 Index cards in multiple sizes and colors. Index Cards. I like to find both lined and unlined ones in multiple colors. They are a bit more durable than just paper, so I use them for information that I will be moving from month to month or week to week in my planner. Most recently, I’ve been writing bible verses that I find meaningful, or verses I’m trying to memorize on them. That way, if it takes me a couple of weeks to memorize a portion of scripture, I can just keep moving that card to the next week in my planner. 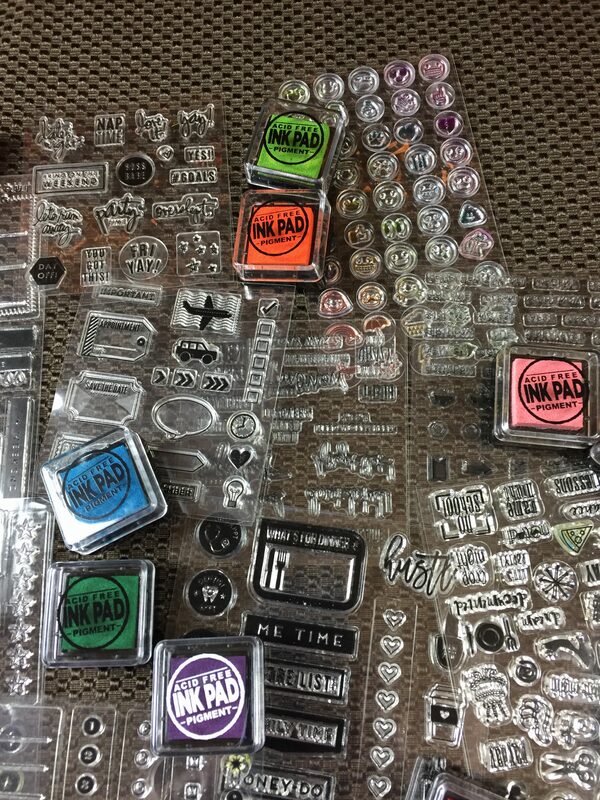 Mini stamp pads and vinyl cling stamps. Rubber Stamps & Ink Pads. 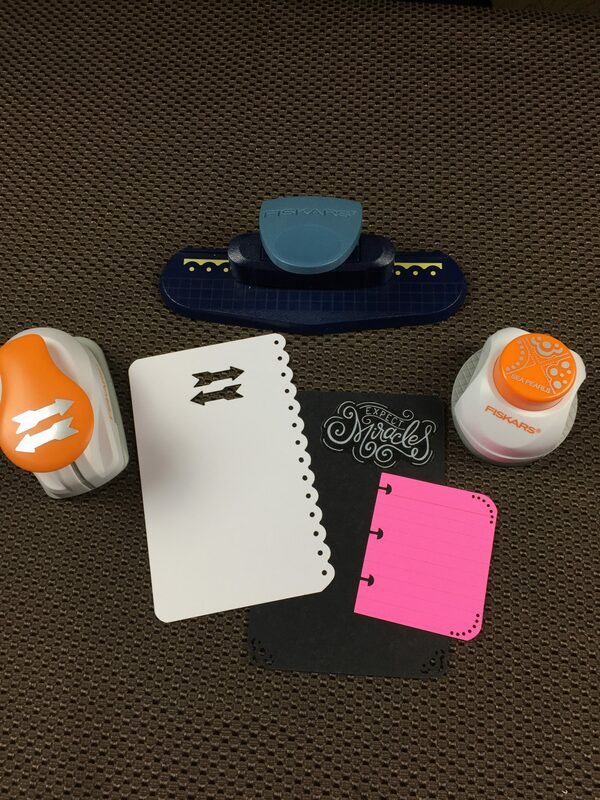 I use a couple of different date stampers and journaling stampers to decorate solid Post Its and plain index cards. It just dresses them up a bit and adds a pop of color. There is no reason you couldn’t stamp directly on your planner page if you so choose. You may want to test this in a small unused area on your planner page just to make sure the ink doesn’t bleed through to the other side of the page. Stickers. One of the simplest and cheapest things you can do is dress your planner up with stickers. They are available everywhere, come in all different themes, colors and sizes and personalize your planner easily. Me and My Big Ideas even has a line out for the happy planner, so I tend to use a lot of these stickers. Corner punches, border punches and shape punches. Shape Punches. These are totally unnecessary, but I find they add a little bit of a design element to those plain Post Its and index cards. You can find them at any craft store and most of the time they are on sale. They make punches that put pretty designs on the square corners of paper or index cards. Other punches make borders along the straight sides of any piece of paper or card stock and some that are designed to cut shapes right out of the middle. Find a planner with a layout you like. Find some accessories that you feel will benefit your planning style. 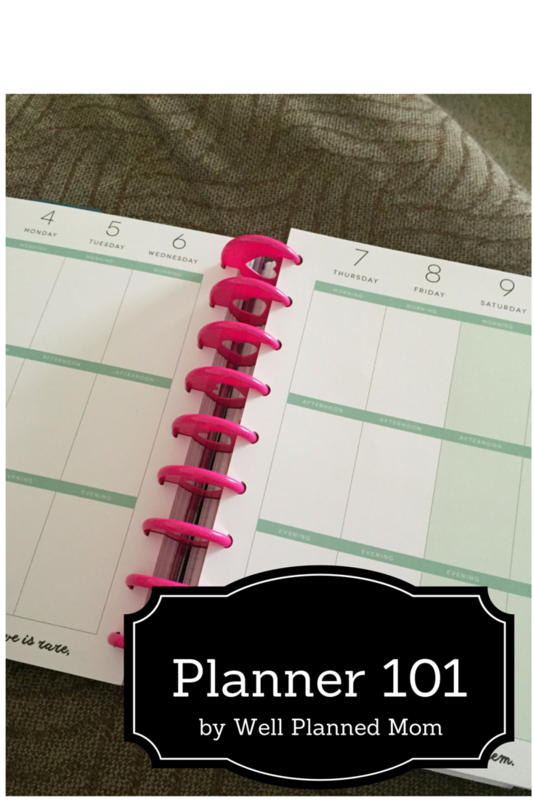 Join me for the next Planner 101 post. Remember, just because you planned it, doesn’t mean it will go as planned! Is one of your goals to be more organized this year? If so, I’m glad you’ve joined me because I am passionate about planning! I’ve had so many people ask me recently to share how I stay so organized and get it all done each day. So I’ll let you in on a little secret…it all starts and ends with a PAPER planner. Not a digital one on your phone or computer, but an actual honest to goodness paper planner. They come in all shapes and sizes, layouts and colors. Let me prove to you why a paper planner is best. I’ll show you how a planner can organize your life and get you started on a path to a more organized life. If you have a paper planner you are currently using, (or trying to use) grab it and follow along. If you don’t yet have a paper planner, you have time to find one you like. You could even grab a cheap one at Target to get you started. My mission through this blog series is to help women get organized so that they can spend more time loving on their families the way God intended. Each week I’ll be sharing some more ways you can use your planner to help you keep on top of everything going on in your life. Don’t worry if your planner is kind of blank for right now, I’ll walk you through filling it in step by step. Make sure to follow along for more planner goodness! And remember…just because you planned it, doesn’t mean it will go as planned:) Happy planning!